If the success of their predecessor, the world-renown Georgia Mass Choir, is any indication of things to come, then the Georgia Mass Choir's newly launched youth edition, "Youth For Christ, " is no doubt, a star in the making. And with the explosive sales of hip hop fused urban contemporary gospel all but dominating the gospel music scene, the four hundred voice teen choir couldn't have come along at a better time. "There was a void in church in the area of music for young people to sing as well for teen choirs, " observes Georgia Mass Choir founder Milton Biggham, who also serves as Executive Director of Savoy Records. "I felt it was time we contributed to filling that void." His contribution was the 1998 formation of Youth For Christ, composed of the talented children of the Georgia Mass Choir, ranging in age between ten and eighteen. Excitement for the project was so great that within two weeks of announcing the idea to members of the Georgia Mass, more than three hundred people had responded. Still, it is the skillful syncopation of the full-bodied, high energy choral unit, and not their lineage, that is expected to propel them to the forefront of today's youth-driven gospel scene and keep them there. The choir gave its premiere performance in September of 1998 during the Georgia Mass Choir's Labor Day weekend recording session and the result of that, a debut recording, entitled "Higher, " was released last November. The emotionally charged live setting added both breadth and flavor to the project, from the foot-stomping uptempo sounds of "Come On, Let's Worship Him, " to the lyrically sound anthem "Psalms 34." The high-powered, urban contemporary title track not only showcased the versatility and depth of the choir's generous ensemble vocals, but made for a bold musical statement for the first youth choir ever to sign to Savoy records. Other standout cuts include a moving rendition of R. Kelly's "I Believe I Can Fly, " and the reworked balladry of "What A Fellowship, " which offered a contemporary spin to the age-old church classic, while featuring director Troy Sneed on lead vocals. "One of the things we tried to do, " Sneed notes, "and the uniqueness of this album is that there are not a lot of songs that youth choirs could sing during Sunday morning services that minister. This album is full of songs geared towards youth and young adult choirs and praise teams. We tried to cover every facet from praise and worship to urban to church hymns to traditional." 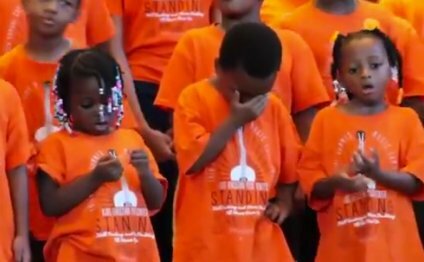 The only prerequisite for the kids whose only experience in singing in church choirs all over Georgia, North Florida and south Carolina, is that they loved Jesus Christ and could sing. Sneed, a former schoolteacher, not only has passion for working with youth, but a solo career as well. His debut album, "Call Jesus, Live at Florida A&M, " was released in March of 1999. Between the Georgia Mass Choir, Youth For Christ and his solo career, the thirty-two year old Jacksonville, Florida native says, "it all balances out." "We titled the album "Higher, " Sneed adds, "because our goal is to take the youth choir to another level...higher. To capture that level of energy that our kids can positively express in a music form that not only seeks to praise God but to usher other church youth into the fullness of his spirit." Tamil Christian Gospel song for Youth.